Buildings – even the most cement-filled – are organic; they change through interaction with the parasites that infest them (us, mostly). How often do architects consider this? Ask any scientist who moves into a new laboratory building and you’ll be met with eyerolls and exasperated stories. The new neuroscience institute that I work in is fantastic in many ways, but has some extremely puzzling features such as the need to repeatedly use an ID card to unlock almost every door in the lab. This is in contrast to my previous home of the Salk Institute which was a long open space separated only by clear glass allowing free movement and easy collaboration. The new issue of the Journal of Urban Cultural Studies is available in print and via pdf through library subscription. 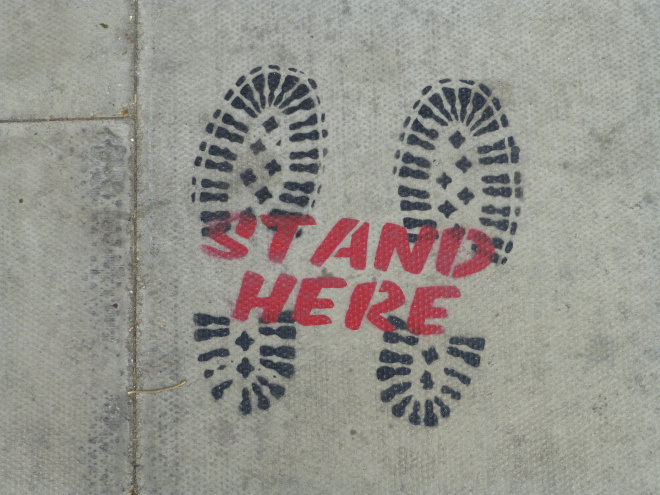 In addition to an editorial, 4 research articles, and 4 short-form articles, this one features a special section on Urban Soundscapes guest edited by Aileen Dillane And Tony Langlois And Martin J. Power And Orfhlaith Ní Bhriain. 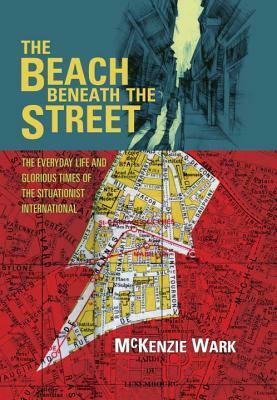 The city is a tangle of temporalities; a privileged time-space where the physics of relativity and lived everyday reality meet. It is not a mistake that Einstein chose a resolutely “modern” example like the “train thought experiment” to illustrate a relativist understanding of space-time. 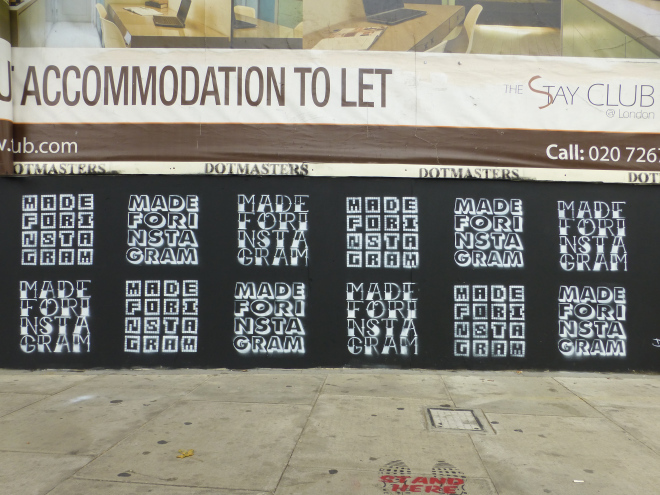 Yet it’s not that the city is qualitatively different than either earlier, “pre-modern” or non-urban spaces, it’s that the city is sine qua non a space where different temporalities are produced. Indeed, that may be the primary draw of the city, and the reason for its growing popularity–to the point where we are an urban species, so inured to the city’s ecologies that we cannot help but think about the “rural” as a series of negative values (cf. Raymond Williams, “The Country and the City”). And in South Korea, a supremely urbanized nation (even in our urbanized world), it is no accident that travel to small towns and provincial cities during the holiday seasons is often likened to travelling back in time. That said, though, it would be a mistake to miss the essential heterogeneity of urban time. In other words, the urban gives us what me might regard as contemporary time, but also eddies of relativistic time. This is at the core of LeFebvre’s Rhythmanalysis, where “linear” time collides with “cyclical” time. LeFebvre’s focus on the chrono-struggle of the city is an important insight. In the ruinous, “creative destruction” of the capitalist city, corporations wring value from the urban by manipulating temporalities. One need only consider the recent investigative journalism from the New York Times on abuses at Amazon: the corporation exploits temporalities to a dizzying degree–to the lasting detriment of their employees. But this “struggle” can take many forms; power (and exploitation) take on a different calculus in different examples. This, of course, is another benefit to the city: it is both incubator and laboratory for temporal disjuncture, with, for example, different development strategies being examples of not only spatial experiments, but (and oftentimes disastrously), temporal experiments. Let’s take these two photos taken along Seoul’s principle North-South axial boulevard, Sejong-no. The first shows adherent of Falun Gong (法輪功) meditating on a corner of Sejong-no and the Cheonggye-cheon (청계천). They’re there, of course, to both publicize the plight of Falun Going in the PRC, as well as gain new adherents. Given the importance of meditation to Falun Gong, it’s not particularly surprising that they would choose this method to spread their message. However: the power of the practice lies (at least in part) in the juxtaposition of temporal rhythms: the rhythms of meditation against the linear rhythms of traffic and commuting. The second photo shows Sejong-no from almost the same spot. I’m standing just a few meters north of where the Falun Gong supporters were meditating. It’s Seoul’s annual Lotus Lantern Festival (연등축제): thousands of people converging on the center of Seoul for a festival, huge parade, and various speeches from Korea’s 조계 (Jogye) order of Buddhism. This year, the festival occurred close to Buddha’s Birthday (a cyclic event) during the year 2559 of the Buddhist calendar. Of course, both of these involve religious ritual practice, and therefore carve out distinct temporalities from the urban flow around them. But the similarities soon end. 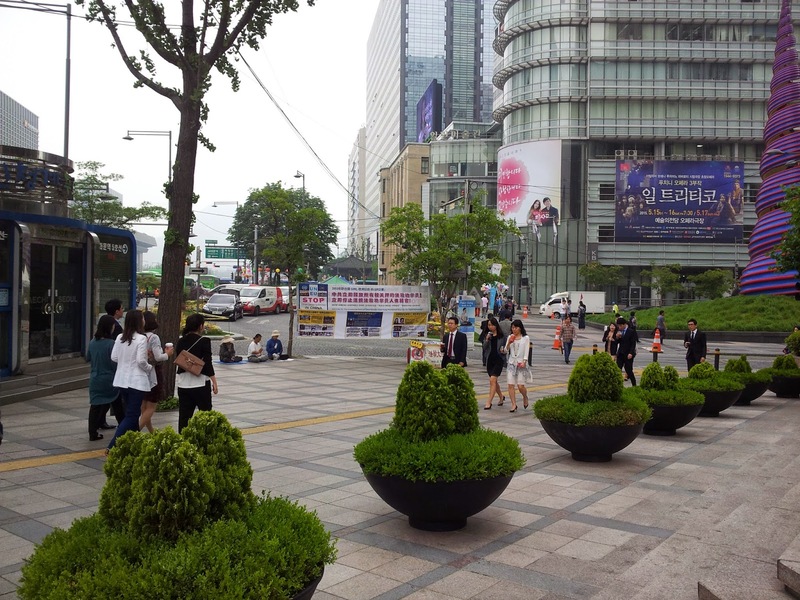 Falun Gong adherents occupy a small corner of Sejong-no, sharing space with tourists, evangelical Christians, right-wing nationalists and others. Moreover, they hold an extremely marginal position in South Korea society, with the government reportedly under pressure from China not to accept Falun Gong refugees. The Lotus Lantern Festival, on the other hand, is a powerful spectacle of religion and nation: the entire street is closed down and festival attendees’ attentions are focused on the main stage stage set directly in front of the Gwanghwamun (광화문), with the festivities broadcast on a couple of huge digital screens for those of us without front-row seats. 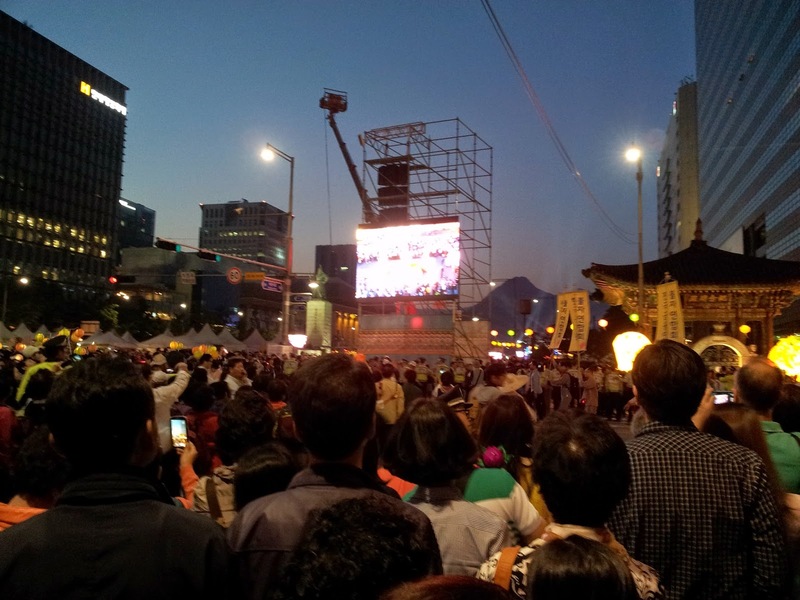 During the short time of the festival (and culminating here on Sejong-no), the different temporalities of Buddhism and nation coincide along a spatial axis that connects Gwanghwamun with the rest of Korea and with the world. Indeed, the speeches themselves tied Buddhism and the Jogye order directly to the health of the Korean state–a nod to the importance Buddhism has held in the formation of Korea (despite its political and geographic marginalization during the Joseon Dynasty). So: while temporality, power and religion are closely linked in any ritual, I would also suggest that, in the city, power inheres in the (temporary) alignment of different temporalities. Perhaps this is one reason for the marginalization of Falun Gong. With adherents quietly meditating on the corner, the practice stays bottled up in what onlookers might regard as an insouciant temporality. But were it able to line up with other times? What then? 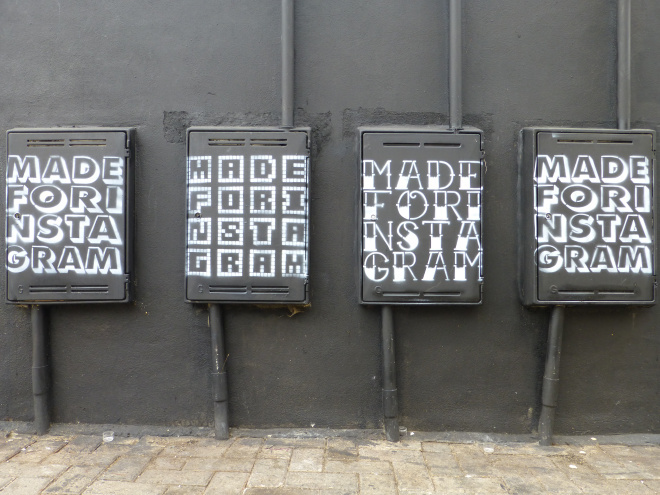 Last week in Camden Town stencil based Street Artist Leon Seesix, aka Dotmasters, was about in order to lay out a series of his newest stencils. 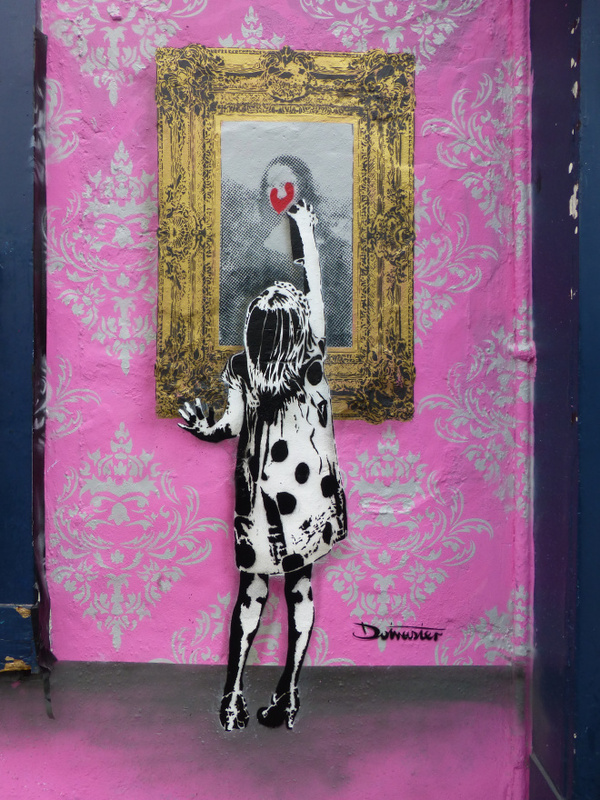 Earlier this year Dotmasters’ was busy at work placing up his ‘Rude Kids’ works all around the East End of London, for his most recent wave of pieces in Camden Town, he has placed up one feature work featuring the tagging of the Mona Lisa and a series of pieces making fun of the modern obsession with social media Instagram, and its relationship with Street Art. 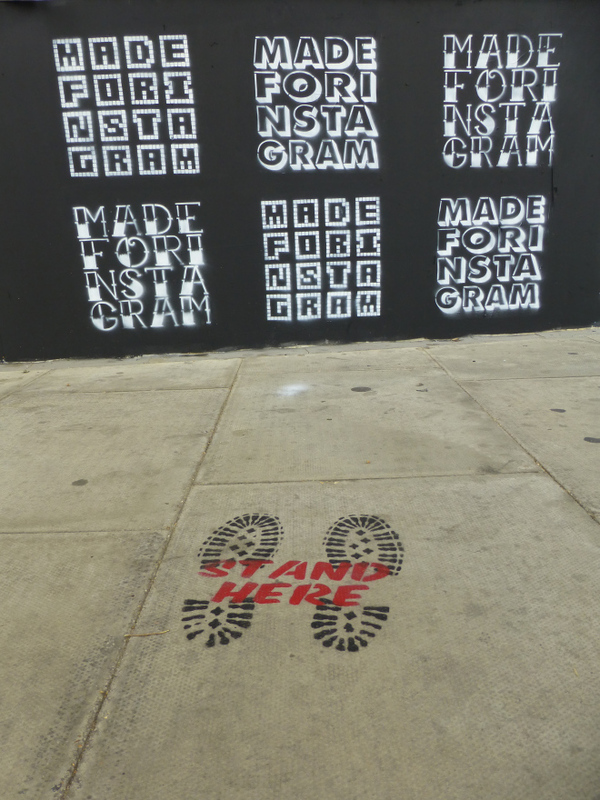 These works were placed up with support from The Real Art of Street Art. 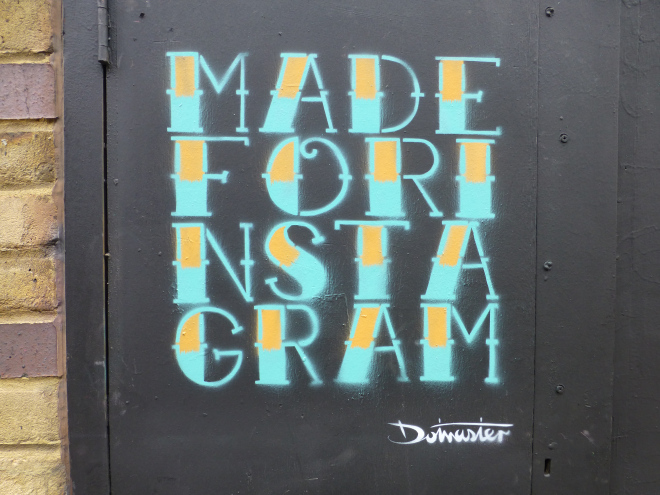 ‘Made For Instagram’ in ready to made square framing.